Tonight, oil is gushing into the Gulf as BP works to replace the containment cap over the leak. The cap was removed this morning. We'll tell you why. 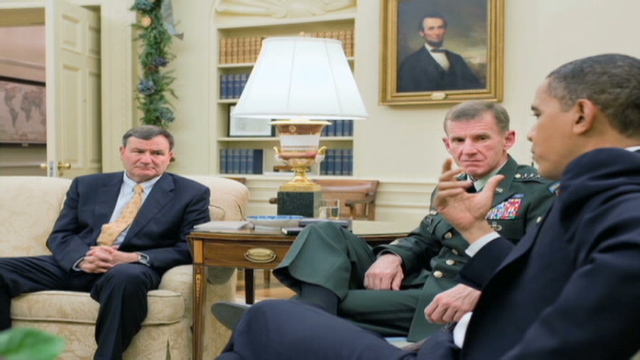 Plus, what happens now that General Stanley McChrystal is out and Gen David Petraeus is in as commander in Afghanistan. BP Alaska: A Ticking Time Bomb? 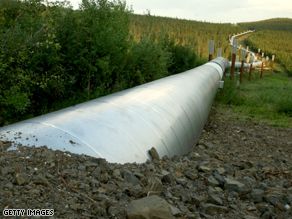 A buried section of the 800 mile Trans-Alaska Pipeline carries crude oil from Prudhoe Bay to the ice free port of Valdez, Alaska. Program Note: See Randi Kaye's full report tonight on AC360° at 10pm ET. That’s what I asked myself this week as I found myself sitting in my office at CNN in New York City with a mountain of documents in front of me. Hundreds of documents that were given to us from a BP Alaska employee named Marc Kovac. It was up to my producer, Susan Chun, and me to make sense of it all. Kovac has been with BP since 1977. He started when he was just 24. Today he builds compressors for them but he worked on the pipelines for 18 years on Alaska’s North Slope. Kovac first shared his story with the nonprofit news website, TruthOut.Org, and when we called him he had plenty more to say. Kovac believes what happened in the Gulf of Mexico, with the Deepwater Horizon explosion, is bound to happen in Prudhoe Bay in Alaska. He says BP Alaska is a ticking time bomb. 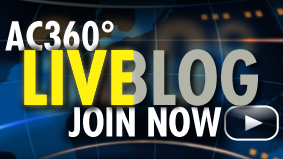 Kovac says, BP has a history of spills, fires, and explosions there. He says employees have died because BP cuts corners when it comes to safety to save money. BP’s Steve Rinehart, in response, told me their budget does not impact their safety program. Kovac is certainly showing courage talking with us. We weren’t sure he’d agree to an on camera interview since he still works for the company but he did. He did say he expects BP management to come down on him for doing an interview with us since, he says, it’s well known that BP has a history of harassing and intimidating workers who speak up about safety concerns. BP says that’s not true and any employee “has the right to raise his or her hand and say stop the job without retaliation” if they feel unsafe. For Kovac, that’s not good enough. He remembers when CEO Tony Hayward promised to make safety the soul of the company. He says that was “lip service, all show and no go.” That is why he’s sounding the alarm today.. hoping to avoid another BP catastrophe.. closer to home. When you're on vacation or live in a coastal community, it's a symbol you simply don't want to see: a no-swimming sign, along with a beach health advisory. 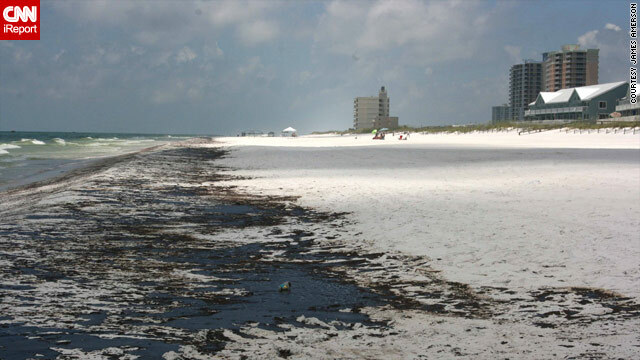 More than two months after the Deepwater Horizon disaster, Pensacola awoke Wednesday to the largest onslaught of black crude on Florida's coast, as more than nine miles of white shoreline and beaches were soaked with syrupy oil. A health advisory has been issued by Escambia County for parts of Pensacola Beach and Fort Pickens. "It's pretty ugly. There's no question about it," Florida Gov. Charlie Crist said. "It does break your heart." 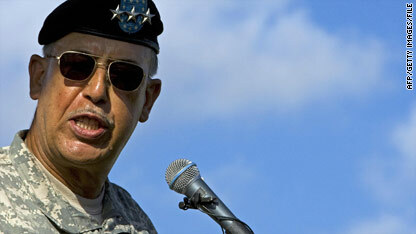 Retired Lt. Gen. Russel Honore knows about the pressure of being a top general. As a lieutenant general in the U.S. Army, Russel Honore was never one to sugarcoat anything. He became known as the "Category 5 General" for the way he commanded the military response to Hurricane Katrina, which was also a mission that thrust him squarely into the media spotlight. "I learned from six weeks of almost 12- to 18-hour days, about dealing with the media," says Honore, who now is a paid consultant to CNN on issues such as the oil disaster in the Gulf of Mexico. "When I was in Katrina, I was always asked how I feel about it. What the sh** do you mean, how do I feel about it? This is what I think. If I'm a leader, I have a mission," Honore says. "I ain't answering no feeling question." The man in charge knew that anything he might say at any point during those long days might come back to haunt him, and in fact, there were some who didn't like Honore's style at all, but he says he tried hard never to let his guard down too much when talking with the media. "The Spill, The Scandal and the President"
Program Note: Tim Dickinson will be speaking with Anderson Cooper tonight on AC360° at 10pm ET. On May 27th, more than a month into the worst environmental disaster in U.S. history, Barack Obama strode to the podium in the East Room of the White House. For weeks, the administration had been insisting that BP alone was to blame for the catastrophic oil spill in the Gulf – and the ongoing failure to stop the massive leak. "They have the technical expertise to plug the hole," White House spokesman Robert Gibbs had said only six days earlier. "It is their responsibility." The president, Gibbs added, lacked the authority to play anything more than a supervisory role – a curious line of argument from an administration that has reserved the right to assassinate American citizens abroad and has nationalized much of the auto industry. "If BP is not accomplishing the task, can you just federalize it?" a reporter asked. "No," Gibbs replied. Now, however, the president was suddenly standing up to take command of the cleanup effort. "In case you were wondering who's responsible," Obama told the nation, "I take responsibility." Sounding chastened, he acknowledged that his administration had failed to adequately reform the Minerals Management Service, the scandal-ridden federal agency that for years had essentially allowed the oil industry to self-regulate. "There wasn't sufficient urgency," the president said. "Absolutely I take responsibility for that." He also admitted that he had been too credulous of the oil giants: "I was wrong in my belief that the oil companies had their act together when it came to worst-case scenarios." He unveiled a presidential commission to investigate the disaster, discussed the resignation of the head of MMS, and extended a moratorium on new deepwater drilling. "The buck," he reiterated the next day on the sullied Louisiana coastline, "stops with me." Program Note: Michael Hastings will speak with Anderson Cooper tonight. Hear that interview on AC360° at 10pm ET. 'How'd I get screwed into going to this dinner?" demands Gen. Stanley McChrystal. It's a Thursday night in mid-April, and the commander of all U.S. and NATO forces in Afghanistan is sitting in a four-star suite at the Hôtel Westminster in Paris. He's in France to sell his new war strategy to our NATO allies – to keep up the fiction, in essence, that we actually have allies. Since McChrystal took over a year ago, the Afghan war has become the exclusive property of the United States. Opposition to the war has already toppled the Dutch government, forced the resignation of Germany's president and sparked both Canada and the Netherlands to announce the withdrawal of their 4,500 troops. McChrystal is in Paris to keep the French, who have lost more than 40 soldiers in Afghanistan, from going all wobbly on him. "The dinner comes with the position, sir," says his chief of staff, Col. Charlie Flynn. "Hey, Charlie," he asks, "does this come with the position?" Greetings from an edgy and interesting Bangkok, Thailand. 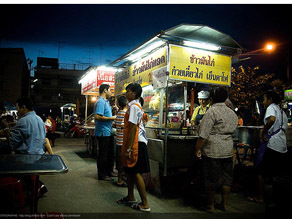 I've set up camp in the Silom area and have been having fun working, writing, wandering, and talking with people. Last week I took my inaugural journey on Air Niugini Airways, flying on the Manila-Port Moresby night flight, and then later over to Singapore on my circle of the region. I don't think they'll be joining the OneWorld alliance anytime soon, but it wasn't that bad either. Washington may be up in arms over General Stanley McChrystal's comments to Rolling Stone magazine about the U.S. mission in Afghanistan and how some of his colleagues are handling it - but some in Afghanistan are asking what the fuss is all about. McChrystal arrived in Afghanistan last summer as the top NATO commander - but if Washington is mad at the general, his friends in Afghanistan seem to be unaffected. He instilled a new hope, they argue, for those Afghans who actually backed the war effort, also angering the Taliban - which ramped up their PR - in the battle for hearts and minds. Gen. David Petraeus to replace McChrystal, source says. Gen. David Petraeus has been been tapped by President Obama to replace Gen. Stanley McChrystal as the top U.S. commander in Afghanistan, according to a top Obama national security source. McChrystal has been relieved of his position as the top U.S. commander in Afghanistan, a top national security source says. 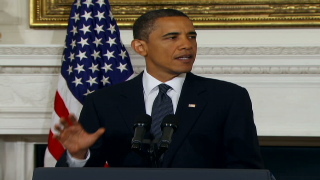 President Obama will make a statement at 1:30 p.m. ET, the White House said. That's only a few hours after he met with McChrystal after politically explosive remarks the general and his aides made about key administration officials in Rolling Stone magazine. The White House has asked the Pentagon to make a list of possible replacements for McChrystal, a senior administration official told CNN Wednesday. Obama will speak on camera about the issue, senior administration officials noted. 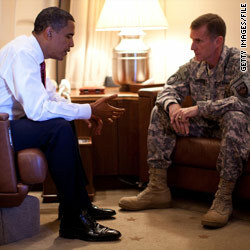 President Obama needs to thank Gen. Stanley McChrystal for his decades of brave and selfless service, then fire him. The contempt the general plainly has for his civilian superiors cannot be tolerated. If a corporal spoke that way about a captain, or a captain spoke that way about a colonel, it would be curtains. The same standard must be applied to the general who is leading 94,000 American troops in combat. By now we all know the reckless and inflammatory comments: McChrystal and his team thinks Obama is disengaged, that Vice President Joe Biden's real name is "Bite Me," and national security adviser (and retired four-star Marine general) Jim Jones is "a clown." Afghan ambassador (and retired three-star Army general) Karl Eikenberry "covers his flank for the history books [so] if we fail he can say, 'I told you so.' "